On this page, you can learn how to extend primary partition space when it has no free space and reports low disk space on SBS 2003. Download IM-Magic Partition Resizer Server to resize disk so as to extend the primary partition space in Windows SBS 2003. Primary partition is running out of disk space on Windows SBS 2003? If you are running into the low disk space problem on primary partition, you can use the IM-Magic Partition Resizer Server to extend the primary partition space. This partition software is able to extend partition, shrink partition and move partition on all Windows Server OS. Any type of disk partition is supported by this powerful partition software. Squeeze some unallocated space from the selected partition by moving the arrows. You need to move the unallocated space close to the primary partition, and then click the primary partition and choose "Resize/Move". Move the arrows to extend the primary partition and click "Apply" button. 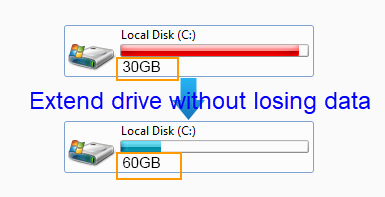 "C drive (primary partition) is running out of disk space on Windows 2003 SBS, so I want to increase the size of primary partition without touching any information on the partition. I tried to run Diskpart command to extend C drive, but system shows the selected partition cannot be extended. Can you tell me how to extend primary partition on Windows SBS 2003?" "Does anybody know the solution for primary partition resizing on Windows SBS 2003? I have installed RAID 5 array on my computer, and the primary partition is running on low disk space. Can I resize the RAID 5 partition without reinstalling system or deleting any data?" Primary partition is different from logical partition, but the solution for primary partition expanding is the same. A third-party partition program is necessary in order to extend primary partition on Windows SBS 2003. IM-Magic Partition Resizer Server works on all types of disk partition when it is running out of disk space and needs to be extended. This partition software works on all Windows Server OS to resize hard disk without having any influence on the data stored on the partition. This partition software enables you to extend primary partition without reinstalling system or rebooting your computer. When a partition is running out of disk space, you may want to free up space on this partition. Formatting is a possible method to erase a partition quickly, but data will be lost after formatting. 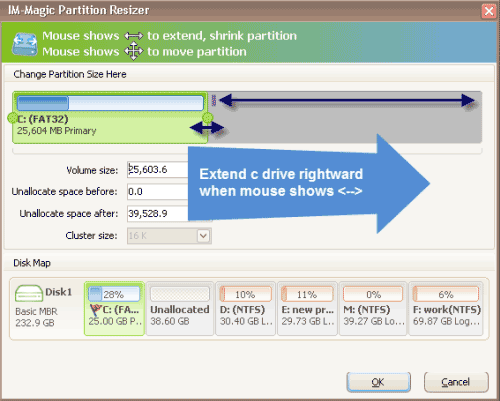 IM-Magic Partition Resizer Server allows you to increase the size of partition so that you don't need to erase the partition or delete any file to free up space on it. This partition software allows you to move free space from other partition that has enough free space to the primary partition or any partition that is lacking of free space. What you should pay attention to is that you can only move free space on the same hard disk. You can extend Windows boot volumes in Windows 2003 VMware with this partition software. If you want to resize disk partition on RAID 5 in SBS 2003, you can add new disk. The new disk will show as unallocated volume after adding to the array, and you only need to run the partition software to add the unallocated volume space to the RAID 5 partition that is running on low disk space. By using this software, you can resize RAID 5 partition without rebuilding the array, so you will not lose any data due to RAID 5 array rebuilding. If there is enough free space on other partition on the RAID 5, you don't need to add new disk but you only need to squeeze some free space from other partition. There are three types of partition which include primary partition, extended partition and logical partition. Under the model of MBR, a hard disk must contain one primary partition at least and 4 at most. The rest space can be divided into extended partition. An extended partition must be divided into several logical partitions before you can use it. A logical partition is a part of extended partition.